The development of Seri Tanjung Pinang (STP) phase two in the north-east coast of Tanjung Tokong here by Eastern & Oriental Bhd’s (E&O) unit, Tanjung Pinang Development Sdn Bhd has entered a critical phase with the company awaiting the endorsement of the state government for its proposed masterplan before it can proceed with the reclamation work. Although the state had granted an in-principle approval to E&O for the masterplan in 2011, E&O still needs the state’s clearance for the masterplan before reclamation work of the STP phase two can proceed. 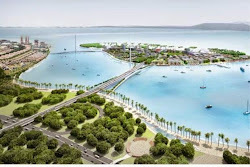 The STP phase two project will involve the reclamation of 760 acres of man-made islands and 131 acres of the Gurney Drive foreshore that will be handed over to the state government for infrastructure development of a new expressway, a new Gurney Drive Promenade, and a parallel linear park for public recreational purposes. It will be the sequel to the 240-acre STP phase one and is expected to have a development horizon of 15 years. Time is also of the essence as E&O’s concession agreement with the Penang state government to reclaim and develop the land is subject to the completion of the reclamation work by 2019 when the reclamation concession expires. Given that the reclamation for the more sizeable STP phase two will be done further offshore in deeper waters compared with the smaller STP phase one that is closer to shore, the project is expected to incur higher costs and take a longer time. In a recent interview here, E&O managing director Datuk Terry Tham said the company had submitted applications to the state government with regard to the endorsement of the proposed STP phase two masterplan. “We can start reclamation only after obtaining approval from the state government, which we hope to obtain by the fourth quarter of this year. Reclamation work is expected to commence thereafter and may take three to five years for full completion. “We should be on track to meet the deadline for reclamation of 2019 as long as we comply with all requirements set by the regulatory authorities. Development can only start after reclamation work has been completed,” Tham told StarBiz. The Department of Environment had on April 10 granted an approval in principle for the detailed environmental impact assessment (DEIA) study and conceptual masterplan of the STP phase two project, subject to compliance to conditions set out by the DOE to ensure the project is carried out in an environmentally responsible manner and is consistent with the prevailing regulatory framework. Tham said E&O was ready to comply with all conditions set by the authorities, which included the necessary requirement of a DEIA study and its approval. “As a responsible developer, E&O has appointed local consultants familiar with local conditions and reputable international consultants with the experience and expertise of reclamation projects worldwide, to verify and help monitor that each stage of reclamation work is consistent with international standards, irrespective of whether it is imposed on us. Penang chief minister Lim Guan Eng told StarBiz earlier this month that E&O would be given the approval by the Penang state government if it complied with all the technical and regulatory requirements for the project. “If all the conditions are fulfilled by the developer, the state government will have to respect the sanctity of the agreement, otherwise it will have to pay compensation to the developer for non-compliance,” Lim explained.